The World Taekwondo Federation approved New Caledonia as its 192nd member national association at its General Assembly in Tashkent, Uzbekistan on Oct. 7, 2010. With the WTF General Assembly’s approval, Burundi became the full member of the WTF and Macau was granted a full member status in recognition of its contribution to the development of the WTF. The General Assembly unanimously approved the proposed amendment to the WTF Rules and Regulations, the proposed amendment to the WTF Competition Rules, and the proposed amendment to the Rules on Organization and Operation of International Taekwondo Championships. Among the major changes to the WTF Rules and Regulations, which will take effect immediately, are the change of the name of the WTF Rules and Regulations into the WTF Statutes, the deletion of the Executive Committee, and the increase in the number of WTF Council members from 32 to 35. Under the new WTF Statutes, English is the only official language of the WTF, while French, Korean and Spanish are auxiliary languages of the WTF. English is the controlling language of both the WTF Statues and the Competition Rules. So far, Korean was the controlling language for the Competition Rules. Big changes were made in the Continental Union section in order to allow greater flexibility in the management of the overall WTF structure and for greater communications between the WTF and the Continental Unions. Some additions were made in the areas concerning the WTF missions and objectivities, the WTF activities and resources, the intellectual property, the Host City Agreement, the sanctions and dispute resolution. “The amendment is to rationalize the organization and further clarify the definitions to make it easier for all member national associations to understand. 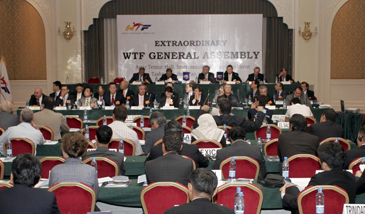 It is also to set the foundation for greater cooperation among the member national associations, Continental Unions and the WTF by providing for more structured channels for better communication in a comprehensive and coordinated way,” said WTF President Chungwon Choue shortly after the approval of the WTF Statutes at the General Assembly. Under the new WTF Competition Rules, which will take effect immediately, four points will be awarded to an athlete for a valid turning kick to the head. In case of 12 points difference between athletes at the time of the completion of the second round, the referee shall stop the contest and shall declare the winner. In case of using four judges or three judges, valid points shall be those scored by at least two or more judges, under the new Competition Rules. The protest system was removed in the new Competition Rules with the introduction of an instant video replay system. “After the 2008 Beijing Olympic Games, significant progress in taekwondo competition has been brought by introducing the protector and scoring system, the world ranking system, and the instant video replay system. Now we have stepped forward to improve again our sport through rule changes to meet the global standard as an Olympic sport,” WTF President Choue said. The WTF General Assembly received a presentation on the proposed WTF Global Membership System and the Mandatory International Athlete License, which will be implemented as early as next year. “We have accomplished so much together. We must continue to build on our achievements. There is so much that we have to offer the world, and they are in need of it,” Choue said. Mr. Abdulla Nigmatovich Aripov, deputy prime minister of the Republic of Uzbekistan, attended the General Assembly to deliver a congratulatory message on behalf of His Excellency Islam Karimov, president of the Republic of Uzbekistan. Mr. Won Sik Kang, president of the Kukkiwon, also attended the meeting to make a speech for the participants in the General Assembly.